Rapid advancements in dentistry, combined with patients who have access to tremendous amounts of information on the Internet, can present both challenges and opportunities for today’s dental practitioner. This is especially true in the overlapping areas of implant dentistry and periodontics. Drs. 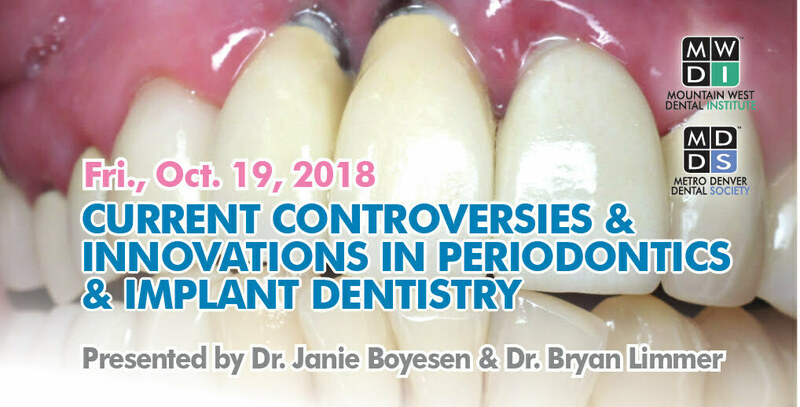 Boyesen and Limmer provide the latest information related to lasers, gum grafting, “teeth in a day,” prosthetic complications and implant maintenance to help you better understand diagnosis and successful treatment. Immediately apply these techniques and methods for enhanced patient care and understanding. This course is designed for both dental hygienists and dentists. Dr. Janie Boyesen earned her DDS from Columbia University School of Dental and Oral Surgery in 2003. She completed her Periodontology Certificate and Doctor of Medical Sciences (DMSc) degree at Harvard School of Dental Medicine in 2007. Dr. Boyesen is a diplomate of the American Board of Periodontology and a fellow of the Pierre Fauchard Academy. She maintains a private practice in periodontics and implant dentistry in Littleton, CO.
Dr. Bryan Limmer obtained his DMD from Harvard University in 2009. He then continued his dental education at the University of North Carolina by completing a 3-year residency in prosthodontics, earning both a specialist certificate and master’s degree in 2012. Following residency, Dr. Limmer completed an additional 1-year fellowship in implant surgery and bone grafting at the University of North Carolina. He has extensive training in both the surgical and prosthetic aspects of implant therapy, as well as the treatment of patients with very complex dental problems. Dr. Limmer maintains a private practice in prosthodontics and implant dentistry in Wheat Ridge, CO.